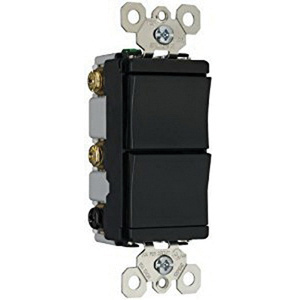 Pass & Seymour TradeMaster® Two 1-Pole decorator combination switch in black color, has voltage rating of 120-Volt AC and current rating of 15-Amps. It measures 1.29-Inch x 1.59-Inch x 2.6-Inch. Switch with up/down action, has impact-resistant face and body. It has fully rounded back body that safeguards wires from being damage. Switch with 12 - 14-AWG terminal connection, has back and side wiring for easy installation. It has full wrap-around metal strap with easily accessible lock-in tabs. Switch is UL/cULus listed.